Parsons Containers Ltd (“Parsons Containers”/“we”/”us”) are committed to protecting and respecting any personal information you share with us. 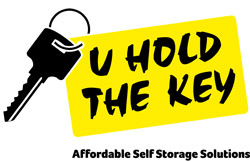 U Hold The Key Self Storage and ContainerContainer are trading names of Parsons Containers Ltd. This statement describes what types of information we collect from you, how it is used by us, how we share it with others, how you can manage the information we hold and how you can contact us. It includes information we collect through our websites, verbally and in writing. The contents of this statement may change from time to time so you may wish to check this page occasionally to ensure you are still happy to share your information with us. This version of our Privacy Statement is live from 1st May 2018. Parsons Containers collect information about you when you engage with our website, engage in telephone enquiries with us, and enter into sales and hire agreements. We only collect information which is necessary, relevant and adequate for the purpose you are providing it for. Parsons Containers will only process information that is necessary for the purpose for which it has been collected. You will always have the option not to receive marketing communications from us (and you can withdraw your consent or object at any time). We will never send you unsolicited ‘junk’ email or communications, or share your personal information with anyone else who might. To contact you when we open, close or move premises. Sometimes we will need to process your personal information to contact you if there is an urgent security issue that we need to tell you about. We do not sell your information to third parties. However, we may from time to time disclose your information to the following categories of companies or organisations to which we pass the responsibility to handle services on our behalf: customer contact centre, our legal and other professional advisors. If we have a relationship with you (e.g. you are a customer ), we hold your personal information for 6 years from the date our relationship ends. We hold your personal information for this period to establish, bring or defend legal claims. Where we have obtained your personal information following a request for information, brochure, quotation or any other information on any of our products or services, we hold your personal information for 3 years from the date we collect that information, unless during that period we form a relationship with you. We hold your personal information for this period to give us an opportunity to form a relationship with you. If you have any specific data protection concerns or a complaint, you can address it to our Data Protection Team at dataprotection@parsonscontainers.com.